The Palmetto Paddlers, Inc. is a non-profit corporation. 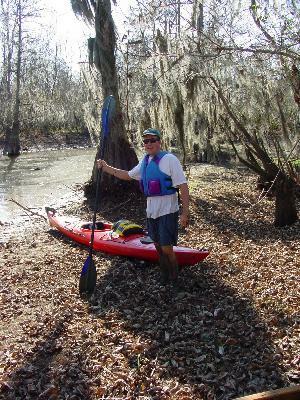 Its purposes are to (1) encourage exploration of recreational waterways, (2) encourage preservation of waterways, i.e., conservation of forests, parks, wildlife, (3) promote enjoyment and appreciation of wilderness cruising and whitewater sports, (4) promote safety/proficiency in rescue/self-rescue, and (5) publish and demonstrate developments in all aspects of paddling. We paddle all kinds of water and membership is open to the public. Individual dues are $15.00 per year and family memberships are $20.00 per year. The Palmetto Paddlers meet in the Vista in the Gamecock Room of the Luther Lee building at the corner of Lincoln and Lady Streets at 7:00 on the last Tuesday of each month. [Map]. Note: Meetings will be on the Saluda in June, July, and August. See the meetings link below and the scheduled speakers for details. Visit the photo album to see who we are and what we do. Palmetto Paddlers filed a comment in opposition to continued fringe land sales on Lake Murray. The sales have the potential to impact water quality, wildlife habitat and the availability of land for recreation. You may see the comment here. Go to the bottom and click where it says "2 pages." If you want to read other comments and motions to intervene, go here and enter P-516 as the docket number. Meetings, Events and trips for 2003. Post Messages, Exchange Information, Calendar Paddling Events, and Check the Calendar at Palmetto Paddlers at Yahoo Groups. Membership in the group is currently unrestricted. Slideshow of the French Broad Trip - November 10 and 11.